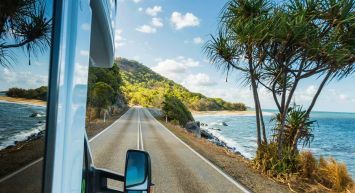 The word is out - travelling from Cairns to Brisbane on a road trip through coastal Queensland is becoming one of the hottest tickets around. 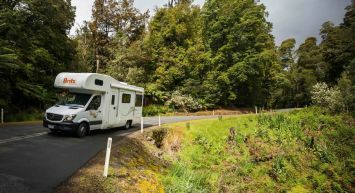 A one way campervan from Cairns to Brisbane offers a glorious adventure, and the opportunity for you to take in some of Australia’s most iconic coastal sights. Klingenstein says the Britz fleet covers vehicles to suit all types of travellers heading along this route. “We have a range of different vehicles from the Toyota two-person vehicle without a toilet and shower in it, so it is a basic setup up, to the six-berth vehicles with toilet and shower and cooking facilities.” The team works closely with all customers to ensure they make the most of their adventure and are confident with all the aspects of their chosen model before setting off. There are many airlines which service Cairns, and spending a day or two in this unofficial capital of the tropical north of Australia is worth it if for no other reason than to acclimatise to the humidity! Cool off with a day trip out to one of Australia’s most fabulous natural resources, the Great Barrier Reef. Various operators conduct half and full day tours for snorkelling and diving to see the reef’s corals, dolphins, turtles and sometimes even whales. Or take a short 20-minute drive to visit the lesser known Crystal Cascades, a secluded freshwater swimming hole that is one of the locals’ best kept secrets. Surrounded by rainforest, it offers a cool respite from the tropical heat, and there are toilets, BBQs and picnic tables so you can bring your own lunch for a picnic. Halfway between Townsville and Cairns, Mission Beach offers pristine and picturesque coastline. Beach bunnies will find themselves spoiled for choice, but bushwalkers will revel in the area’s World Heritage rainforests of the Wet Tropics. The area offers cool walking trails including Bicton Hill, Licuala Fan Palm Walk, Edmund Kennedy Walking Track and Lacey’s Creek, and the chance to see 60 per cent of Australia’s butterflies that call the area home, as well as the endangered Southern Cassowary. Townsville is the kicking off point for another of Queensland’s famed hotspots - Magnetic Island. 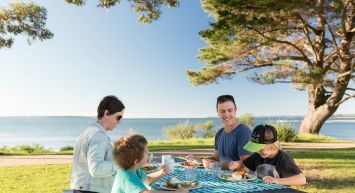 Here you can enjoy walking trails littered with stunning views of the waters and picture-perfect coastline as well as a huge sleepy koala population. Magnetic Island is just 20 minutes off the coast and is the perfect location for a day trip, with plenty of island activities to keep you busy. Townsville is also home to the Australian Institute of Marine Science which conducts important research into our country’s marine environments. You can join a free tour of the Cape Ferguson facility every Friday (March to November). If you’re feeling the need for a spot of island hopping, you can’t go past the Whitsunday Islands. The township of Airlie Beach is the perfect gateway to cruises around this spectacular archipelago within the Great Barrier Reef Marine Park which includes the famed soft white sand of Whitehaven Beach. You will need to wear a stinger suit in stinger season but don't let this put you off, as the 7km long beach with its turquoise water will leave you speechless. While you are there make sure you walk up to the Hill Inlet to soak up the stunning views over Whitehaven beach. And if you haven't got enough book a one-day sailing trip to experience remote snorkelling spots. Captain James Cook made his second landing in Australia at the spot where the town of 1770 now stands - in the year 1770 unsurprisingly! There is a Captain Cook monument here, but the town and that of nearby Agnes Water offer pristine beaches, great markets and the chance to do a day trip to Lady Musgrave Island - an impressive 14-hectare low-lying coral cay. Explore the working Bustard Head lighthouse, just 20 minutes north of town, with its tortured and tragic past featuring shipwrecks, murder, disappearances and other mysterious happenings. Highlights here are the Bundaberg Rum Distillery (Happy Hour, anyone?) where you can tour the factory and taste the goods made with local sugar cane. Mon Repos Beach is the place to be to see the annual life cycle of marine turtles. Rangers can take you on a tour to see the turtles lay their eggs (November to January) and baby hatchlings waddle their way out to sea (January to March). A day trip to Lady Elliot Island can also offer another unforgettable marine experience - swimming with manta rays. These incredible gentle creatures have a wingspan of up to 5m! This great seaside town has some wonderful caravan and tourist parks. It’s also the perfect jumping off point for a 4WD day trip to heritage-listed Fraser Island. Think picture-perfect freshwater lakes, soaring rainforests and tranquil bushwalks. Whilst here make sure you don't miss the SS Maheno shipwreck, the Champagne Pools and Lake McKenzie with its crystal clear water and white sand beaches. The island is also home to the dingo, a native Australian dog which can be spotted if lucky. Fraser Island is the highlight of the Wide Bay region and an absolute bucket-list tick for any traveller to Queensland. Home to some of the most beautiful beaches Australia has to offer, Noosa also has some great crowd-watching opportunities from swanky cafes and Michelin-star dining along Hastings St. Treat yourself to some breathtaking views across main Beach to Tea Tree Bay at Noosa and there is world-class bushwalk tracks and rockpool swimming opportunities within Noosa National Park, literally right next door to the famous Hastings Street. For a spot of angling, hire a boat at Pelican Beach in Noosaville and cruise up the picturesque Noosa River past Tewantin. All Queensland beaches north of 1770 can attract marine stingers during the summer months. Beaches further north have longer stinger seasons, including from Cape York to Townsville - October to June; and from Townsville to Gladstone - December to March. However, most popular beaches in areas prone to marine stingers have stinger-resistant enclosures so beachgoers can enjoy swimming throughout the year. It is important to swim inside the enclosures as they are the only safe swimming zone on the beach. Beaches south of 1770 are usually stinger-free year-round. Inspired to travel from Cairns to Brisbane? To get started on this journey, book a Britz campervan today. Or check out our latest deals and specials here.